Zoodles! 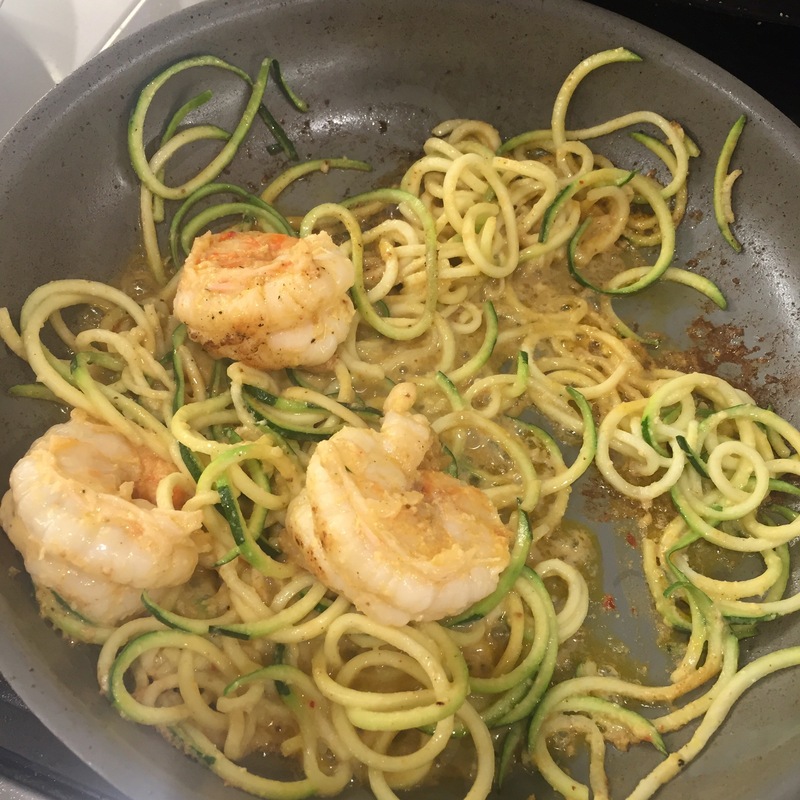 Time to get on the Spiralizer train – this zoodle recipe is HOT. And oh so incredibly easy! 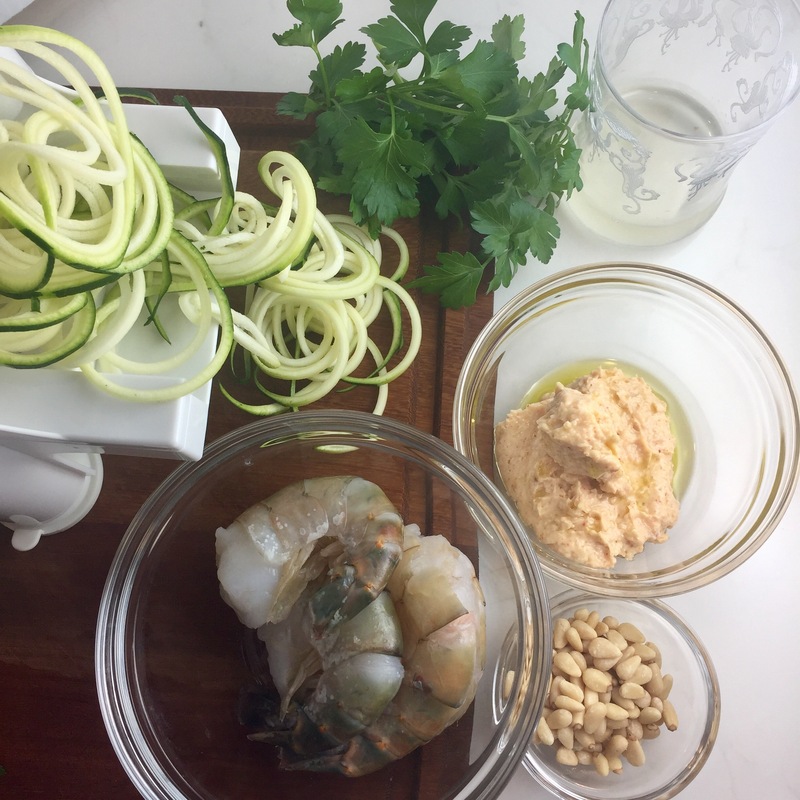 Don’t own a Spiralizer yet? Get this one on Amazon. It’s on Prime. It gets to your door in 2 days. It’ll probably get there before you get your ingredients from Safeway. It’s probably on your doorstop right now. So go ahead and order your Spiralizer now. I’ll wait. Got it? Great. Now let’s talk about what this thing does. The Spiralizer slices veggies in a spiral shape, which makes those thinly sliced veggies ideal for salads, noodle substitutes, and curly veggie fries. While the Spiralizer has many uses, I mostly use it to make Zoodles. They are “noodles” made of spiraled zucchini that can be used as a spaghetti noodle substitute. They’re ideal as a substitute for gluten-free, guilt-free and paleo-friendly recipes. And they’re shockingly delicious. So let’s get to Spiralizing! 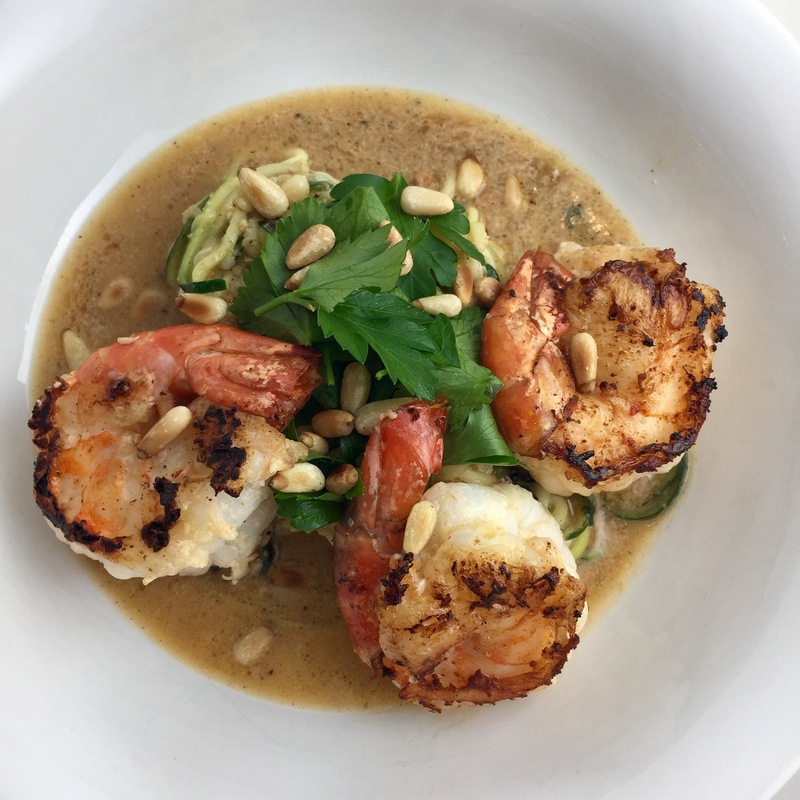 This recipe uses a Spiralizer to make “Zoodles” and hummus to make a quick “sauce” in a recipe I call “delicious” (air quotes not necessary). To toast the pine nuts, heat a non-stick pan on medium high (do not add oils) and add nuts. Watch closely and stir until pine nuts are fragrant and light brown. Be very careful as nuts burn quickly. Set aside for garnish. In a small bowl, add 1 tbs of olive oil, hummus and water and whisk until combined. Use some of the hummus mix to marinate the shrimp. In a non-stick pan over medium high heat, add 1 tsp olive oil until shimmering. 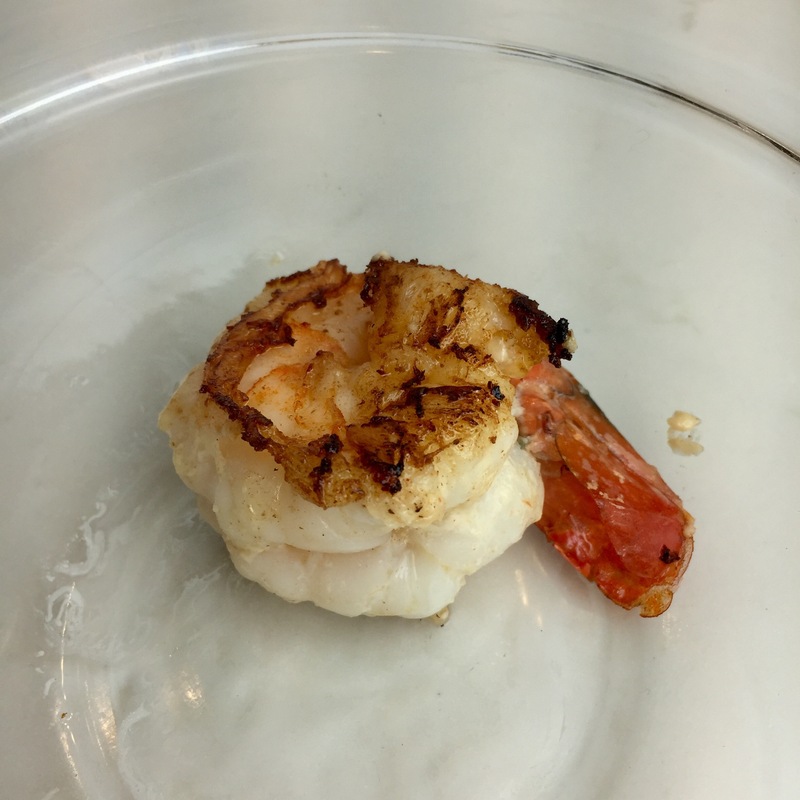 Sauté shrimp until browned and crispy on the outside and until the white parts on the middle are opaque. 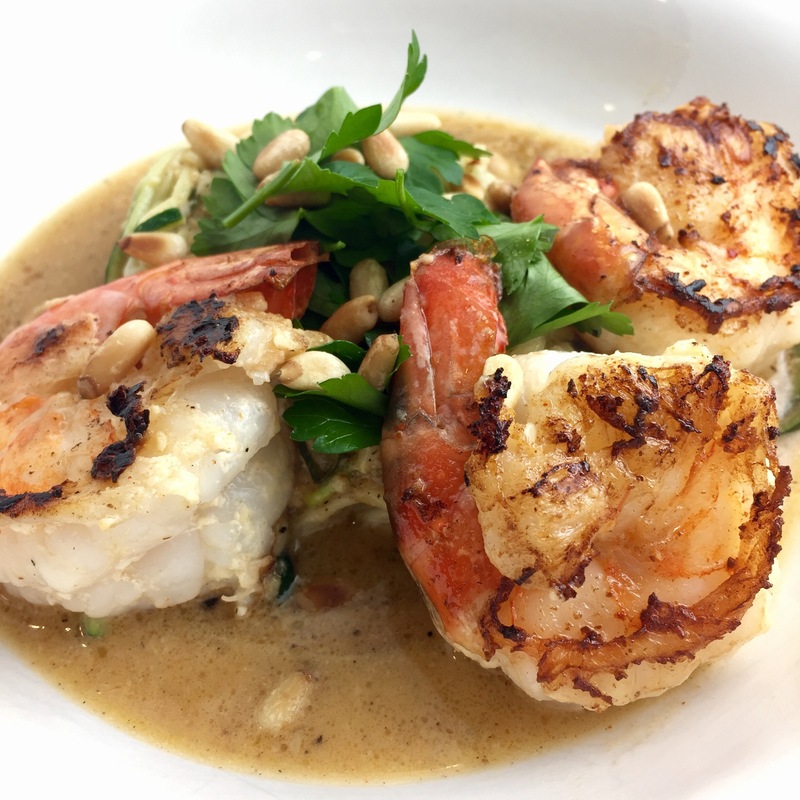 Set shrimp aside in a warm place. In the same pan used to cook the shrimp, lower the heat to medium. Add hummus “sauce” and cook just until warmed and more liquid in viscosity. Add zucchini noodles and cook until completely coated in sauce and the noodles are el dente (about 2 minutes). Note: the zucchini noodles will let off water and should create a more liquid sauce. Add back shrimp to pan to coat. Serve in a bowl and top with chopped parsley and toasted pine nuts. Eat and feel good about (a) how fast Amazon ships and (b) how healthy you are!